Electric storage heater grants are provided by the Government's Affordable Warmth Scheme which is part of ECO, the Energy Companies Obligation. You may qualify for free storage heaters if you receive certain state benefits and you have faulty storage heaters in your home. The Affordable Warmth Scheme was introduced to reduce the heating bills of those on state benefits by replacing old inefficient storage heaters with new modern, energy efficient storage heaters. The scheme is based strictly on replacing inefficient heating systems with their modern equivalents. Unfortunately, grants are not available to install new storage heaters if you don't already have any currently installed in your home. The amount of your storage heater grant is based on an EPC (Energy Performance Certificate) which will be prepared free of charge. However, although some householders may qualify for free storage heaters, others may have to contribute to the cost of installation. We will only know after the EPC has been prepared but if you are not happy with the amount of any contribution, you can withdraw your application without cost. Remember though, any contribution you make will be offset by lower heating costs in future. Storage heater grants can only be calculated after a survey of your heating system and an EPC (Energy Performance Certificate) has been prepared for your home. But the way that storage heater grants are calculated favours householders who live in large houses and discriminates against those living in small houses and especially flats. Consequently, although free storage heaters are available under the Affordable Warmth Scheme, if you live in a flat or you have more than 3 or 4 faulty storage heaters, you may be asked to contribute to the cost of your new storage heaters. This is because your grant will be insufficient to cover the total cost of installation. To remedy this, there are proposals to change the way the scheme works by removing the need for an EPC. This will mean that storage heater grants are directed more towards householders suffering from the effects of fuel poverty, rather than to those who live in large houses. However, these changes to the Affordable Warmth Scheme are not scheduled to come into effect until April 2017. Electric storage heaters contain heat retaining clay bricks which store heat during the night and release it throughout the daytime. They are sometimes referred to as night storage heaters because some electricity companies offer cheaper electricity during the night time when demand for power is lower. The Economy 7 electricity tariff allows householders to take advantage of cheaper electricity in the seven hours between midnight and 7 am. Storage heaters can be installed almost anywhere, as more homes have mains electricity than a gas supply. 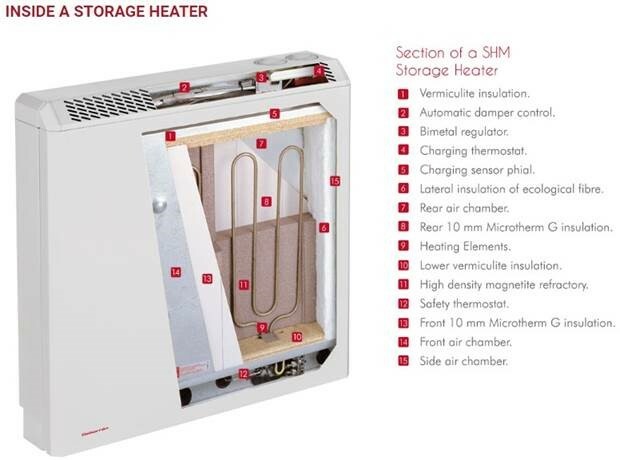 Storage heaters have few moving parts and consequently they are very reliable and require little or no maintenance. Storage heaters are relatively inexpensive to install compared to other domestic heating systems as they require no expensive pipework or plumbing. Storage heaters are also clean, have a long life span and are very easy to upgrade. Electricity is more expensive than gas per unit of heat energy. Storage heaters are less flexible than some other heating systems and do not offer instant control in the same way. If your heating has been switched off for a while and you are relying on overnight electricity to heat up the storage heaters, you will not have heating until the following day. Fan assisted electric storage heaters use electricity from an off peak electricity tariff supply to heat up a highly insulated thermal storage unit. Instead of just releasing that heat by convection, a silent fan takes in cool air from the room and discharges hot air through a vent. Fan assisted electric storage heaters are more efficient at retaining the heat they have built up and the supply of warm air into the room can be controlled by a timer and a thermostat. 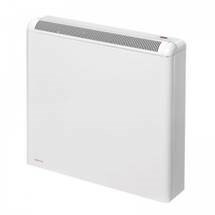 Fan Assisted Storage Heaters are available with the Affordable Warmth Free Storage Heaters Scheme. Combination convector electric storage heaters are just like standard electric storage heaters but with a built in convector heater. The convector heater can offer an alternative heat source to the electric storage heater or a boost to the heating provided by the storage heater. Combination Convector Storage Heaters are available with the Affordable Warmth Free Storage Heaters Scheme. Modern electric storage heaters are far more energy efficient than the traditional, old bulky ones you may have installed in your home. And given that the aims of the Affordable Warmth Scheme are to improve your home's energy efficiency, reduce your heating bills and cut carbon emissions, you can rest assured that the electric storage heaters installed under the scheme will be the most efficient available. Because modern electric storage heaters are much more energy efficient than their older counterparts, you should also cut your heating bills considerably. When demand for electricity is low, it is sold to householders at a lower cost than when demand is high. Electricity supply companies have therefore introduced systems such as Economy 7 to provide electricity at a lower cost during the seven hours of night time. By using night time electricity to keep your home warm during the day time, electric storage heaters will always be cheaper to run than electric heating systems which take electricity during the day time. By taking advantage of the Affordable Warmth Scheme, your free storage heaters will reduce your heating bills. Economy 7 is an electricity tariff where your usage of electricity can be measured and charged according to the time of day. It means that if you have electric storage heaters you can pay less to heat them up during the night than during daytime hours. The off-peak cost of electricity used during night time hours is around one third of the cost of on-peak electricity you use during the day time. Economy 7 is ideal for households with electric storage heaters because they heat up using cheap electricity and keep your house warm when electricity would be more expensive, during the day. Modern storage heaters are much more energy efficient than older models, so if you qualify for free storage heaters your heating bills will fall further. Not only are you using cheap electricity to heat your home, with modern, energy efficient new free storage heaters you will use even less electricity. You must receive certain state benefits to be eligible. There are four ways you can qualify under the Affordable Warmth Scheme Benefit Test, but you only need to pass one of them. Please tick all of the relevant boxes below which relate to your state benefits. This information will only be used to determine your eligibility to qualify as part of the Affordable Warmth Scheme and you will be asked to provide evidence of any benefits you receive, at the time of the technical survey. How many bedrooms are there in your home? How many storage heaters are installed in your home? How many of your storage heaters are faulty or do not work properly?